We know that how our rites of passage are acknowledged, welcomed and/or celebrated (or not!) teaches us a lot about the life phase we are moving into. Our first rite of passage was our own birth, generally followed by our menarche, or “onset of menstruation”. For many of us, our menarche was not acknowledged or celebrated in the manner in which we would have liked. Perhaps our Mum’s (or mother figures) simply handed us some pads, told us the basics, and spoke nothing more of it. Some of us started bleeding at a time when other changes or stressors were taking place, such as the death of a family member, moving home or school, or parents separating. Generally speaking, it’s safe to say that this important rite of passage could have been honoured in a much deeper way, and we could have been taught more valuable ways of honouring our bleeding time. I for one was taught to soldier on somewhat, medicating away my period pain with pain killers. I never recall being advised to rest and go inward and honour this sacred time. As a result, I unconsciously absorbed and took on the belief that women should “soldier on regardless” or that work, social or family obligations were more important than connecting with the deeper part of myself. I most certainly was never taught about the connection between menstruation and moon cycles! Truth be told, I didn’t think much of it until recently completing the School of Shamanic Midwifery’s Four Season’s Journey. I now understand the link between life, lunar, seasonal and menstrual cycles, and have a much deeper connection to and appreciation of my moon time. 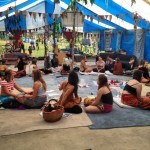 Through the year on the Four Seasons Journey, and via one drum journey in particular, I felt called to revisit….to reclaim our Menarche via the creation of a sacred Menarche Healing Ceremony. The ceremony is designed for post-menarche women who’s first blood was not honoured as it could have been. The ceremony is designed for women who want to release old messages and reclaim and rewrite new ones, about what it is to be a woman! 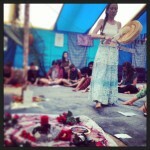 Recently I ran this ceremony at Regrowth festival in Braidwood. 34 amazing women came along, and over 2 hours, we walked together, hand in hand, back to the time when we first bled. We identified any unhealthy or unwanted messages that we received about being a woman at and around that time, and we released them. We then tapped into the empowering beliefs and our feminine wisdom and rewrote the script about what it means to be a woman, so to speak. We then stepped forth in our full power, and reclaimed our Selves! There were some tears as we revisited our wounded parts, but there were smiles from ear to ear as we reclaimed our empowered, grounded, capable, knowing, and awesome Selves. I feel truly blessed to be able to offer this ceremony to my community and hold the vessel that is the sacred “circle as shaman”. I dream of a day when every woman has the opportunity to heal her menarche, and when every Mamma has reclaimed her menstrual power before walking her daughter/s to the threshold of womanhood. 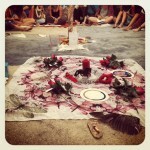 This ceremony is offered in Sydney, Central Coast, Newcastle, and Hunter Regions.